Which taxpayers saved the most from tax cuts under Gov. Scott Walker? took control of the legislative and executive branches of government in 2011, they have saved Wisconsin taxpayers more than $8 billion. Although we rated her claim Mostly True, the tax changes enacted by Gov. Scott Walker will not reach over $8 billion until the end of fiscal year 2019. How much of an impact have the cuts had on individual Wisconsinites — and whom? According to a report by the Wisconsin Budget Project, the tax cuts tended to favor people with higher incomes. The analysis of the tax cuts was measured in three different ways: share of the total tax cut in terms of the revenue loss to the state; average tax cut in dollar amount that taxpayers at various income levels received; and tax cut measured as a share of the taxpayer’s income. The largest portion of the $1.7 billion in revenue lost in major tax cuts for 2017 went to Wisconsin taxpayers with the highest incomes, says the report. People with an average annual income of $1.7 million, the top 1 percent, received $420 million in tax cuts in 2017, or 24 percent of the entire value of the income-tax cut. Together, the top 20 percent of highest earners received 60 percent of the tax cuts, with the remaining 80 percent splitting the rest. The lowest 20 percent by income — those earning an average annual income of $15,000 — received just 2 percent of the value of the tax cuts. 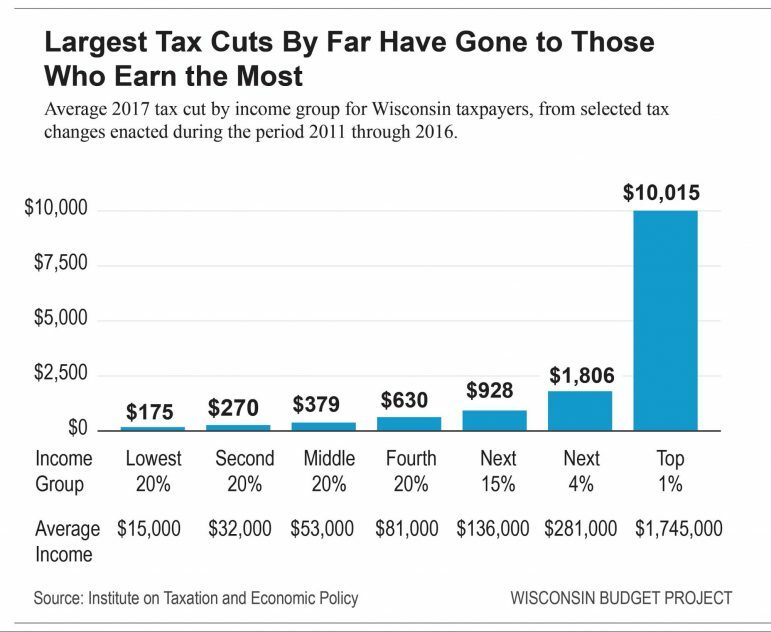 According to the Wisconsin Budget Project’s analysis, the value of the tax cuts in dollar terms rose with income, in other words, taxpayers who earned the most money also got disproportionately larger tax cuts. Each higher income group received a larger average tax cut than the groups with lower incomes. In 2017, the top 1 percent received on average $10,015 in tax cuts — or $193 each week. The bottom 20 percent received only $175 for the same period — about $3 a week. According to the report, the top 1 percent received a tax cut 57 times higher than that of the lowest income group, meaning that top income group saved more per week than the lowest earners saved for a year. In terms of the tax cut measured as a share of income, again the highest earners received the largest tax cuts on average, with the lowest income group getting the smallest benefit proportionately. The Wisconsin Budget Project found that for Wisconsinites earning the most, the tax cut amounted to 0.70 percent of their incomes — more than twice as much as the bottom 20 percent, who got a tax cut equaling 0.33 percent of their incomes. The other income groups received average tax cuts between 0.54 percent and 0.62 percent of their incomes. Based on the Wisconsin Budget Project’s analysis, Walker’s tax cuts benefited the highest income taxpayers more than lower income taxpayers. The tax cuts further benefited the wealthiest taxpayers, who already pay a smaller portion of their income in state and local taxes than poorer taxpayers, according to the Wisconsin Budget Project.